This year we wanted to bring a variety of different posts to our blog, as well as collaborating with more bloggers. 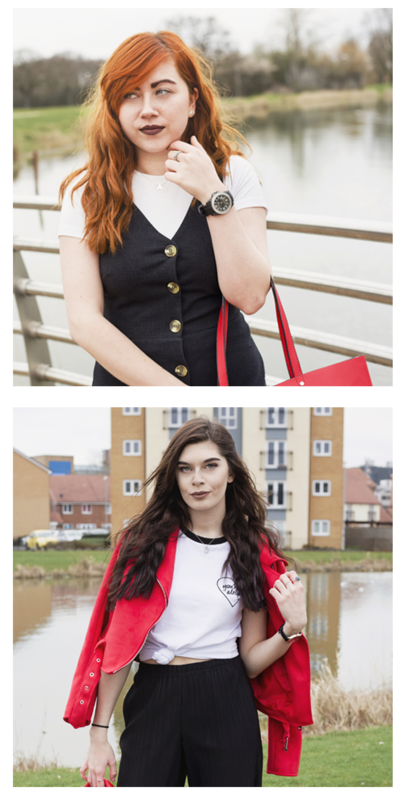 So when blogger/vlogger and music journalist, Sophie Eggleton tweeted that she wanted to work with other creators, we saw it as a perfect opportunity for our first collab of 2016. We often love interview posts as they allow us to get to know other bloggers/youtubers/creators, so we decided it would be a great idea to interview each other for our blogs and hopefully spread the word about the work we do. Sophie is somebody whose videos we watch daily, mainly because of the way her creative personality shines through her work. We hope this post will let you get to know her a bit more and take a look at what she creates! When did you first start interviewing bands and how did you get into it?/Who was the first artist/band you interviewed? Do you ever get nervous or flustered around interviewees? Hmm. I don’t get star struck at all. We’re all humans after all – we all have bad breath in the morning, all go to the loo, all imperfect in our numerous ways. It’s a shame in a way because my job would be more fun if I did get super excited about meeting the people i do. That said, it’s nice to share a few minutes of conversation with people you admire and respect…particularly when they live up to your expectations. The things that makes me flustered is knowing that I am about to chat to an artist that has a huge fan base, because I know there is more at stake. Knowing that more people are going to view the interview (and will have an opinion on it) means you want to do the best job you can with the questioning. Festivals and red carpets can be stressful too. You often don’t get any time in-between the interviews (so you can’t refer or revise any notes), and sometimes bands you know nothing about are flung in front of you and you are expected to hold an interesting and informative conversation with them for 15 minutes. Who are your favourite type of people to interview (musicians/artists etc)? I don’t have a favourite person in terms of what job they do. I just like people who are open and happy to explore more in depth questions. Sometimes people come to an interview with a guard up (some for very understandable reasons), and some have been so media trained you feel like their answers are off a script. I just like to feel like I am having a genuine and relaxed conversation…so it almost doesn’t feel like an interview. I do like mixing it up, and speaking to people who work in different worlds and industries. It keeps the job interesting. What advice would you give to people wanting to start a career in music journalism? Think of ways that show your passionate about. Start a blog/channel where you talk about your love of music – post reviews of the gigs you go to, the music you’re listening to, opinions on music news or trends. When you go to work experience interviews you’ll then have an online portfolio of work that proves you are dedicated, motivated and interested. Perhaps see if the local paper or student magazine will let you write about music. Try and get work experience, or create your own work as soon as you can (podcasts/zines/website). Don’t wait till you’ve finished studying. Use your weekends, holidays, evenings to explore possibilities, do work experience, hone your writing/photography. See if any locals bands would like bio’s written for their websites for example. Report on local festivals and musical events till you get accepted to cover the larger events and bands. Write to online sites as they are always looking for new writers. The majority don’t pay, so they’re are looking for people willing to write in return for exposure/guest passes/experience. What was your favourite gig/festival you went to last year? That’s so tough, as they all have their different strengths and reasons for purchasing a ticket. Download always has a really good vibe to it – it feels like everyone there is there for the same thing…to enjoy amazing live music. Reading Festival has nostalgic appeal as I’ve been going almost every year since I was a young teen, and they always have a wonderfully eclectic line up…but that one is also my busiest work-wise. I love the intimate nature of Slam Dunk as it’s relatively compact – it’s also incredible how it has grown over the years. The line up for this year is incredible. Boardmasters has that laid back surfy appeal, and is in a beautiful seaside setting. The UK has a festival for every preference. So we know your boyfriend is in a band, we’re curious to know do you class yourself as a Young Guns fan or just a supportive girlfriend? Hmmm. Well I was friends with the YG chaps for a few years before Si and I started going out. In fact I think I knew Si the least. We’d hang out at festivals because they were doing press and I was on the other side of it. I always liked their music and would go to their gigs when I could (and would sing all the words). When I like a band I’m never really fussed about the band member’s private lives or meeting them etc, so I don’t think I appear like what people in this age call a ‘fan girl’, so I think that’s why it wasn’t too weird when Si and I got together. Although I love their music, and think they’re a great band, it’s not like I was ever secretly stalking them or anything. I’m so pleased I do like their music though, can you imagine how awful it would be having to go to gigs and listening to music you didn’t like all the time. Or having to listen to their demos and give your opinion…either having to lie, or be honest and say you didn’t like it and wait for the repercussions. When did you realise you wanted to make a YouTube channel and what made you make the jump and do it? Well I’ve actually had a channel for yonks. For the majority of the time it was just a place to upload the videos I had…even just phone videos of squirrels in my garden, or the amusing cats I used to house sit with. It’s only in the last few years I’ve come to understand that it can be a job. Even when I started doing interviews I didn’t know about subscribers or anything. I had no idea who Zoella was back then, all that’s been a fairly recent thing. I’d never even look at my channel again after uploading the videos to see how they were doing, and I’d have week or months between uploads. I decided a couple years ago or so (I’m guessing) that I would see if I could do this ‘YouTube’ thing.It feels like video is where it’s all headed and I started to see that jobs I used to get as a journalist/interviewer would go to YouTubers, often purely because they had a reach and influence. It’s still very early days in terms of taking it seriously, so I’m still learning, working how it all works, and deciding how I want it to develop. What is your favourite type of video to make on your channel? Do you prefer making ones that you know will be more popular with the audience or would you rather make whatever you find most fun? In the last week I’ve actually started doing videos that link more to the work I did when I was at uni. I studied Fine Art and by the end of the three years my work was video based installations. Prior to that I have actually had a lot of pleasure from the ones that aren’t the big hitters view wise. The Honest blog videos about health/mental heath and the various stresses that affect us, probably mean the most to me. I get emails and messages throughout the week from people opening up about their own experiences, and it’s an honour that they feel happy to open up to me about these personal things. It’s actually stressful at times to deal with the replying to them all though, but also the responsibility of it all. I’m not an expert or guru and I’d hate to give the wrong advice. I hope I offer some comfort though! From watching your videos we’ve seen how hard YouTube can sometimes be for you, have you ever wanted to give up? What keeps you motivated to carry on through tough times? I have thought about it. I hate to quit though, and I very rarely give up on something unless I really have no other option. There are many things I probably should have quit…I’m rather stubborn like that. What do you think you’d be doing now if you weren’t in your current career? When I was little I thought I’d have a cafe with my friend Alice…called Sophie and Alice’s Cafe – great imagination huh? I used to do kids parties, so for a while I thought I may go into childcare or something of that nature. Choosing Fine Art at uni, I thought I may be an artist or do something that used art like advertising for example. I went into fashion styling for a bit…but it didn’t suit my health issues. I think I may have trained to be a therapist or something that involves working with people in need. Do you prefer writing blog posts or making YouTube videos? It constantly changes, at the moment I’m on a YouTube hype for sure. What do you put most of your time into, blogging or YouTube or do you balance it equally? At the moment it’s definitely YouTube – you need to get views/subscribers to secure paid work so I am concentrating on that right now. If I get more paid work I can dedicate more time to writing the posts I love and filming the videos that mean the most to me, because the financial pressure will be off. To be honest getting views on my blog has never really been a real goal for me. Of course it’s absolutely thrilling and lovely when people do stop by, but for me this was intended as an outlet, somewhere I could vent or talk about the things I love. I’ve been very lucky that having a blog has allowed me to do certain things though – attend events, review products etc. I’ve actually only just joined to Bloglovin – and have never really attempted to build an audience aside from occasionally tweeting out the link. I’m definitely not someone to come to for advice on building a blog audience! Your life seems very interesting and busy, how do you make sure you find time for your blog and YouTube? If I have work I need to do I sacrifice social life. Rightly or not. I hate to let people down so if I have a deadline there is no way I’m not meeting it, even if it means I miss doing something I was hoping to do. I don’t let friends down (if I can avoid it) but I’m content in sacrificing those things that I wanted to do for me. The hardest thing is juggling boyfriends, work, friends, etc. Si is away for a large chunk of the year, so when he is home I feel I should soak up as much time as possible with him, which is hard when you are juggling work commitments, friends commitments and life laundry. It’s extremely hard to get the balance right…and it’s an ongoing struggle. As you get older other things come into play too…like making sure friends/family in need are looking after too. In terms of fashion you have quite a unique sense of style, do you like to follow trends or do you just buy whatever you like the look of? I’m so schizophrenic when it comes to style. Some days I look like a teenage boy, other days I really want to look ladylike and sophisticated (I struggle because I can’t walk in heels and I’m terrible at make up), then the next day I’ll like sporty minimalism. I don’t follow trends rigidly. I think by my age you sort of know your body and what you’re comfortable in, and I can pick out which trends to adopt and which ones to disregard. One things I would recommend is going shopping and setting yourself a challenge to try on things you’d never usually try (even things you hate) – I’ve found items I’ve loved that I would have dismissed on the hanger. What are your favourite topics to write about on your blog? It really depends on my mood. Some days I feel silly and frivolous and want to wax lyrical about the charms of a skirt. Other days I feel weighed down by serious topics and feel I should use a blog platform to do something a bit more worthwhile. We shouldn’t look down on posts that are more trivial, fun or superficial though. It is so important that we have things that allow for escapism. The world can be pretty hard going at times, and little pockets of light can do us the world of good. I like Claire Marshall a lot, we are similar age so I relate to her a bit more than the younger YouTubers. Her editing is flawless and has a definite style, but it was her video about her mum that really cemented my respect for her. It was a very emotional watch, but it brought us back to reality and away from the superficial world that can sometimes dominate the world we work in. Laura Jane Grace comes to mind from the music world. She’s made a transition that is hard to go through under normal circumstances, let alone as a famous musician. In doing some she has become a spokeswoman and role model for a whole new community. I’m sure some of her interviews/words/actions have had a hugely positive impact. My favourite blogger is Amber Interiors. She creates the most dreamy interior design. She even has her own shop now selling her beautiful homeware items. Her aesthetic is basically how I’d love my home to look one day. Where do you hope to see yourself and your YouTube channel in a years time? I’d love to have settled into a groove by then. I feel like finding the space in my garage to film has already helped me in terms of finding my visual style, but it would be nice to be relaxed and in the swing of it. I would love to be in a stable position with it all. I neither need or desire big bucks, but I just want to feel secure, and not have to have the constant worry about whether I will ever be able to pay rent for a place or live. I hope I will still have that close relationship with my subscribers though. I do worry that as you get bigger that relationship gets diluted….we’ll see. I’ll definitely try my best to maintain it. 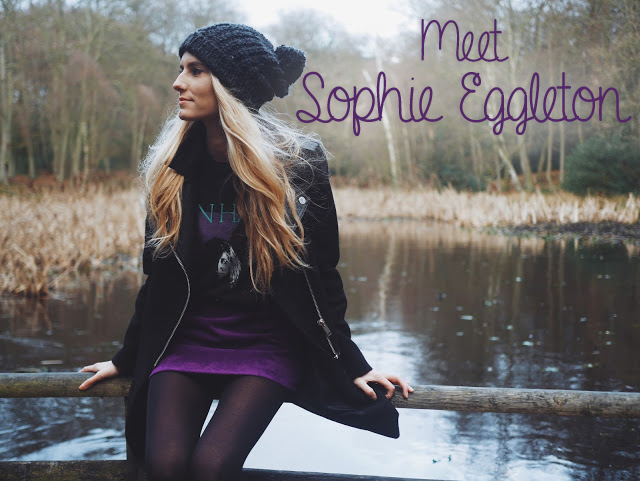 If you’re looking for a new YouTuber to watch or blog to read you should definitely check out Sophie’s channel and blog. We keep up to date with both regularly and are really excited to see what she has in store this year. Thanks Sophie for taking the time to answer our questions we really appreciate it! I love working with other bloggers as it’s a chance to get to know them but also for other people to get to know how amazing they are too!